Millennium Reign Energy LLC’s proprietary product, the AutoARK® is a fully automated hydrogen generator created for residential, small business, telecom sites and/or agricultural applications. The AutoARK® focuses on affordability, ease of operation, and safety for the owner. 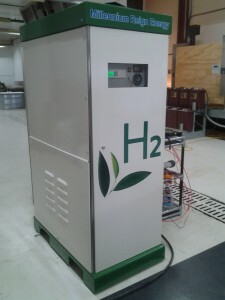 Composed of cells in a horizontal stack it is scalable to meet any need for hydrogen production. Built with high efficiency in mind, the waste heat and medical grade oxygen by-products of the AutoARK®, can be used for home or other uses. Enhancing the practicality of on site hydrogen production. This AutoARK® system is encased in either powder coated steel or stainless steel and is fully automated for ease of operation. Safety features have been incorporated to allow for use by all consumers. The AutoARK® also runs on energy created from wind and solar, completing the circle of life. True sustainability: clean green fuel, powered by renewable energy. Purification to 99.995 available for extra cost and equipment.